Pixar Pier opens on Saturday, June 23, at Disneyland Resort. The Disney California Adventure makeover is a re-theming of Paradise Pier into an area that celebrates Pixar’s vast catalog, from the shorts to newer films such as Coco. The Incredibles-inspired Incredicoaster anchors Pixar Pier, a white and red roller coaster winding above the different neighborhoods. Under its sprawling tracks, you’ll find the elements of Pixar Pier I’m most excited about: new food! Remember that gag in Monsters, Inc. with the abominable adorable snowman offering yellow snow cones proclaiming, “Don’t worry, it’s lemon!”? It’s the premise of this booth with a variety of dairy-free lemon soft serve options. I love the frozen parfait, which mixes lemon soft serve with a blue raspberry slush. While challenging to eat in hot weather because it melts quickly, the chilly treat is delicious and refreshing and the portion is sizable. Note: do not let the lemon soft serve drip onto your hands, as it will take at least two hand washings to get the yellow coloring off your skin. The Lamplight Lounge (formerly Ariel's Grotto and Cove Bar) menu offers a variety of gastropub style dishes in small plate and entrée sizes. The Crispy Piggy Wings are in the Bites (small plates) category and are a refreshing, tender take on poultry wings; the chili ginger glaze reminds me of the duck wings available at Carthay Circle Lounge—spicy, a little sweet, and distinctive enough to make you want more immediately. The scent of chocolate chip cookies plays a role in the Incredicoaster, as Mr. Incredible uses Jack-Jack’s favorite treat to tempt his son into safety. Then, when you exit the attraction, the Jack-Jack Cookie Num Nums stand conveniently awaits you. Of the three cookies available, you can’t go wrong with the warm chocolate chip cookie with the same name as the food stall. It’s a thick cookie with chocolate chunks and chewy dough. I’m still thinking about it. I know. Potato skins. Big deal, right? They are a big deal at Lamplight even though they’re in the Bites section of the menu. These are a dressed up version of the bar food with a brown butter caper yogurt, a smoked paprika aioli, and manchego cheese. They’re fried, but they aren’t weighed down with oil. They’re light, fluffy, and can I get more right now? Bonus: the portion size for this small plate was surprisingly hefty and filling. Disney Parks has gone all in on the flavored churro train, and they’re continuing the new tradition with the rethemed churro stand on Pixar Pier. The Caliente Churro has some heat (which is a recurring trend with foods on Pixar Pier) with a vibrant red coating that tastes like crushed Red Hots. I’m ride or die for cinnamon flavoring, so I wanted to lick the sugar off the churro…which I partially did. 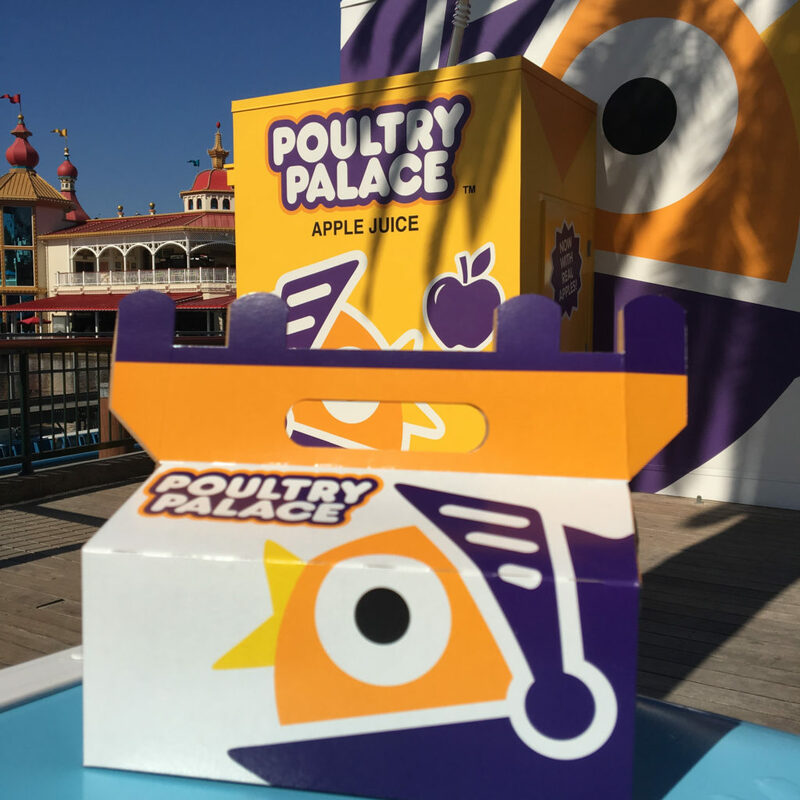 Poultry Palace from Toy Story Toon: Small Fry comes to life on Pixar Pier. You can find the menu items that used to be available at this food stand pre-Pixar makeover, including a turkey leg and corn on the cob with chili lime butter (so tasty), but the new item is my favorite: a chicken drumstick box. The breading is spicy and crisp, and the three drumsticks come in a cute lil’ box with a side of coleslaw. Look, I know warm donuts aren’t anything innovative, but it doesn’t matter. The only dessert offered at Lamplight Lounge, the donuts come in an aesthetically pleasing box with chocolate and raspberry dipping sauces. They’re sugary, warm, and fluffy enough to practically melt in your mouth. Mmm. If you’re going to skip a Pixar Pier snack, make it Angry Dogs. Take a picture of the cute Inside Out-inspired stall, and move on. The hot dogs at Angry Dogs are okay (you can get better ones at Award Wieners) and they come with Lays potato chips or Chester’s hot fries…which you can get outside the parks. But hey, like adventure, more food options are out there. Explore wisely. The Instagrammable snacks of Pixar Fest.